If you are looking for an alternative to the iPad Mini, it's hard to ignore the Samsung Galaxy Tab. Samsung devices are among the best selling Android-based tablets, making significant gains in 2013. Amazon's Kindle Fire HDX and Google's Nexus 7 tend to get a lot of press, but the Galaxy Tab 3 does a better job of garnering sales. So how does the Galaxy Tab 3 stack up against the iPad Mini? Amazon may have ignited the 7-inch tablet market with the original Kindle Fire, but the tablet itself was nothing special. The Kindle Fire was slow, with limited storage on the bare bones version and a lackluster screen. Amazon has since improved upon the Kindle Fire, recently releasing an impressive line of Kindle Fire HDX tablets. Unfortunately, Samsung's lineup of Galaxy Tab tablets takes more from the original Kindle Fire than the newest models. It is easy to be impressed with the iPad design. Apple has focused on making a thin, light, easy-to-hold and easy-to-use tablet. And it shows. In comparison, the Galaxy Tab feels cheap and awkward. Even the layout of the buttons shows a lack of usability, with the suspend button right above the volume buttons, which leads to accidentally suspending the tablet when you just want to crank up the volume. The installation process is easy, with Samsung guiding you through setting up an optional Samsung account, a Google Play account and even a Dropbox account, which is a good idea considering how cloud storage makes the process of sharing files between devices easy. The Galaxy Tab also comes with two pages of default apps, including Flipboard, Google, two web browsers, two ways to play movies, a world clock and a separate alarm app. And if that sounds a little bloated, it is. The default apps tend to be a little overkill, with Samsung mixing in their own apps on top of the Android standard apps. The latest Galaxy Tab comes in three flavors: 7-inch, 8-inch, and 10.1-inch, with both the 7-inch and 8-inch models aimed at the iPad Mini. The Galaxy Tab 3 7.0 for the 8 GB Wi-Fi model has options to expand the storage capacity to 32 GB and add 3G or LTE support. It also supports up to 64 GB microSD external storage. The 8-inch Galaxy Tab includes a higher resolution screen, better dual-facing cameras, and a slightly faster processor. So how good is the Galaxy Tab 3 at being a tablet? Slow and disappointing. The 7-inch Wi-Fi version benchmarks as one of the slowest Android devices, with the latest Google Nexus 7 and Kindle Fire HDX easily doubling the processor speed and the latest iPad Mini outpacing it even further. It feels almost like cheating to compare the iPad Mini to the Galaxy Tab 3. Whether you are looking at the original iPad Mini or the latest iPad Mini, you will be getting a tablet that feels better in your hand, has access to more apps, delivers a great experience with a much snappier response time to almost anything you try to do with it. 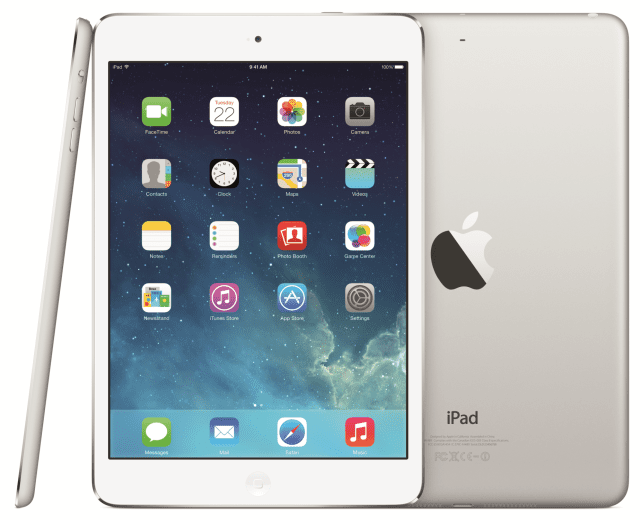 The iPad Mini 2 is essentially a 7.9-inch version of the iPad Mini, making it one of the fastest tablets on the market. And while the original iPad Mini has the guts of an iPad 2, it still runs circles around the Galaxy Tab. The one area where the Galaxy Tab 3 reigns supreme is the price. But while the 8 GB Wi-Fi model might sound like a deal, users might quickly feel cramped. The Android operating system takes up 2.7 GB of space, and after you factor in default apps, the user is left with less than 5 GB of storage. This means you'll either want to upgrade via external storage or go for the 16 GB model, both of which will add to that price. Many comparisons come away with no clear winner, with a list of advantages and disadvantages weighed on each side of the equation. This is not one of those cases. Apple's tablet won the iPad Mini vs Galaxy Tab 3 fight by TKO in the second round. And if it wasn't for a super-cheap price tag, Samsung's tablet would have been knocked out within the first 30 seconds of the match. There's nothing wrong with Android tablets, which have several advantages over the iPad Mini, including an open architecture and the ability to place widgets on the home screen. The problem here is that Samsung's Galaxy Tab 3 is a slow, outdated tablet wrapped in a cheap exterior with poor dual-facing cameras and a confusing lineup of sizes and models. The Galaxy S series of smartphones may be Samsung's flagship smartphone, but the Galaxy Tab lineup is definitely in the bottom tier. Google's Nexus 7 is one of the best on the market for an affordable price. Amazon's Kindle Fire HDX series compares favorably to the Nexus 7 in technical specs, but it is also tied to Amazon's Appstore, which is limited compared to Google Play. If you want to go with a Samsung device, the Galaxy Note class of tablets may cost more, but they are worth it compared to the Galaxy Tab. What Is the Best Tablet for Your Kid?